5 TOOTHPASTE HACKS THAT ACTUALLY WORK! We use toothpaste daily and it's in almost everyone's essentials. Not Only does toothpaste whitens, brightens and cleans your teeth but it can also be used for household cleaning to beauty uses. Get ready to be intrigued by our list of toothpaste hacks and some of them will really shock you. NB: Before trying any of these methods out, make sure you power down your phone, remove the battery (if you can) and seal the ports of your phone with tape to prevent liquid damage. - The key here is to use actual toothpaste, not a gel-based toothpaste. - If you have the odd CD, DVD or even old PC game lying around? Well here the solution. 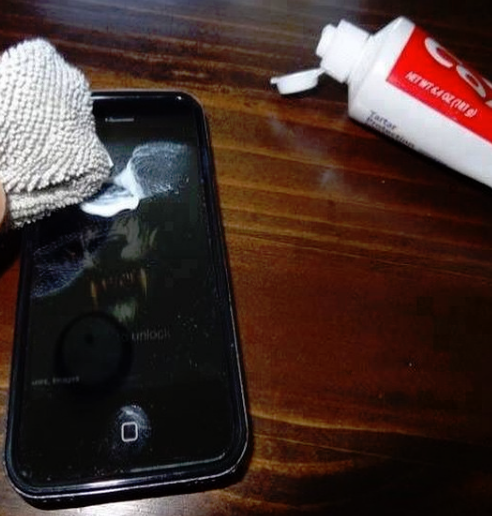 To remove the scratches just buff with a small amount of toothpaste and a clean cloth. - For someone who has or has had white trainers this might be a life save for you. The white rubbers often get darker or yellowish with time and you can revive them by grabbing some white toothpaste (no colours or gels) and apply directly to the dirty area with a cloth. - Use a tiny amount of toothpaste on a toothbrush to gently buff clean your silver jewellery and diamonds. Rinse thoroughly after and wipe clean with a cloth. - Is your iron no longer smooth and spotless? Gunk on iron will not only hamper its effectiveness but could also stain clothes. Gel toothpaste acts as the perfect mild abrasive for removing the gunk found on a well-used iron. Apply a layer to your iron, scrub off with a clean rag and rinse well.